Right here, right now is the best time in the history of mankind to be a beer drinker. America now has more breweries than at any time since prohibition, and globally, beer culture is thriving and constantly innovating. Drinkers can order beer brewed with local yeast or infused with moondust. However, beer drinkers are also faced with uneven quality and misinformation about flavors. And the industry itself is suffering from growing pains, beset by problems such as unequal access to taps, skewed pricing, and sexism. 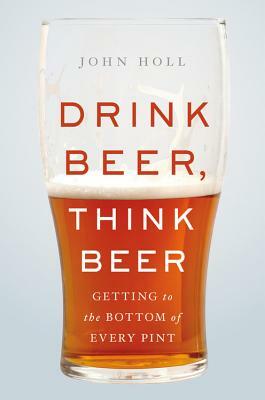 Drawing on history, economics, and interviews with industry insiders, John Holl provides a complete guide to beer today, allowing readers to think critically about the best beverage in the world. Full of entertaining anecdotes and surprising opinions, Drink Beer, Think Beer is a must-read for beer lovers, from casual enthusiasts to die-hard hop heads. "John Holl doesn't just offer an ideal primer on beer--he tells you why you should care about it in the first place, with good humor and insight gained from years of experience. For those who haven't had the pleasure of bellying up to the bar with one of beer's brightest, this is the next best thing." "Holl's book is a kaleidoscopic look at beer, the making of beer, the drinking of beer, and the culture that has evolved with the craft beer industry. In the act of telling his story, he unveils all the mysterious language of the alchemists who frequent brew pubs across America." "Drink Beer, Think Beer - released early this month - is a broad and intelligent overview of the current trends, good and bad, that drive the industry of the world's second most popular beverage." "A lovely, quick read that will benefit anyone aspiring to be more critical about their beer drinking." Buy Digital Audiobooks via Libro.FM.